You can see lots of pictures of these wonderful animals by clicking the image above. The earliest mention of the Gloucestershire Old Spots breed in English literature dates to around 1790. Believed to have been descended from the native Old English pigs of western England, with the probable addition of Neapolitan pigs imported from Italy in the late seventeenth century, an official herd book was established in 1913. The herd society had the desire to preserve the old “Orchard” or “Cottage” breed of spotted pigs which had been developed and held primarily in the Berkeley Valley of Gloucestershire. Bred to grow and fatten on the windfall from orchards, left-over whey from cheese-making, and row crop remains, the breed fell out of favor when it could not meet the demands of modern pork production. American importations at the turn of the 20th century and later have distributed Old Spots genetics to modern breeds such as the Spotted Poland China and the American Spot, but the original breed was near extinction in Britain by 1977. Preservation efforts in Britain and further American imports in the 80’s and 90’s have been successful in bringing the breed back from the brink, however, numbers still remain in the “critical” range in both countries. 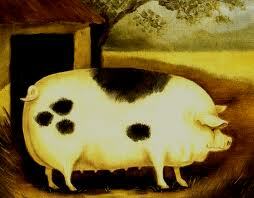 The Old Spots pig is friendly, funny, and floppy-eared, with a large, rounded body. They are white in color and can be sparsely or liberally decorated with black spots. Their endearing, comforting appearance is romanticized in illustrations and folk art, and even on the “big screen”. (Have you seen the well-endowed boar that appears in a recent movie adaptation of Jane Austen’s “Pride and Prejudice”?) A laid-back, multi-purpose pig supplying succulent bacon, pork, and vitamin-d rich lard, they are well suited to the small farm, especially those striving for “sustainable agriculture” systems, as they are hardy to outside climate extremes, do well on pasture, can eat virtually anything, and are excellent breeders and mothers. A mature boar can weigh over 600 pounds and a mature sow, over 500 pounds or larger depending on age and food intake. The Breed Standard is set by the British Pig Association and describes the various elements that make a good pig for breeding or showing. Use the standard judiciously in an effort to only register and breed from the best stock. Don’t get too concerned. If you are looking at a piglet of 8 weeks old, you won’t be able to detect a heavy jowl but concentrate on the important elements such as the legs, underline (teats) and overall conformation. The GOS is a large breed, white in colour with a minimum of one distinct black spot. It has lop ears which will almost cover the face of a mature pig. Skin: Must not show coarseness or wrinkles. Coat: Silky and not curly. No mane bristles. Not less than one clean decisive spot of black hair on black skin. Black should not predominate. Coat: A rose disqualifies. A line of mane bristles is objectionable. Sandy colour may disqualify.